The Importance of Seeing a Doctor After an Accident | DeLoach, Hofstra & Cavonis, P.A. After the shock and stress of a serious accident, your adrenaline takes over. You don’t remember what you're saying, you block out the pain, and you just want to go home. Unfortunately, going home is the worst thing you can do—both for your health and for your chances of getting compensation. Failing to see a doctor is one of the worst mistakes people make after an accident, and there are a number of reasons it happens. Some people wave away medical responders or witnesses after a slip or fall because they're embarrassed. Others walk away from a crash because they don't think they're severely injured. Many people don't have health insurance, and avoid going to the emergency room because they cannot afford treatment. Further injury. While you may not feel much pain in the moments after the crash, it's not uncommon for victims to go home only to feel debilitating pain hours later. Some victims may suffer head injuries such as hematoma or hemorrhage that can have fatal consequences if not detected immediately. Insurance company denials. An insurance company often has time limits on which medical care it will pay for after an accident. If you wait more than 72 hours after a car accident for initial treatment, your auto insurer could claim that your injury was unrelated to the crash and deny coverage. Loss of evidence. If you go to the emergency room, doctors will likely perform a variety of tests to understand the extent of your injuries. The imaging tests they perform—such as x-rays, CT scans, and MRIs—are valuable evidence in your claim, because they show your condition immediately after the crash. Your medical documentation also helps prove the amount of compensation you'll need to overcome your injuries, including receipts for prescriptions, assistive devices, and co-payments. Low settlements. An insurance company will do anything possible to minimize the amount it has to pay for claims. If you get medical treatment immediately, companies are often more cooperative, because they would rather pay for a small initial expense than a lengthy treatment that could result in a high settlement. Insufficient medical payments. 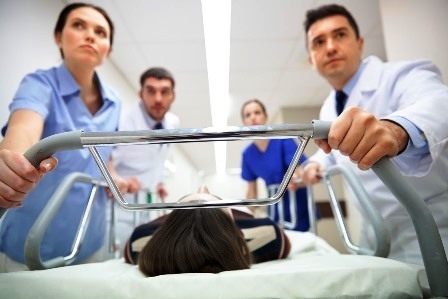 Too many victims refuse medical care after an accident because they can always go to the hospital “if something gets worse.” The best course of action is to go to the hospital immediately, and again if symptoms worsen, because the first visit provides a connection to any future treatment. In short, an emergency visit on the day of the accident makes it possible for you to claim later injuries are related to the accident. This gives you a clear line of evidence that make it more likely you'll recover enough compensation for all injuries, rather than just some of your medical costs. Although it's hard to think clearly after an accident, it's vital to stay calm in order to protect yourself and your family after the dust has settled. If you're unsure you need medical help following a crash, it's always better to be safe than sorry. Doing so could not only save your life, it can ensure that you get full and fair compensation for all that you have lost. Whether you were injured as a result of a slip and fall, car accident, truck crash, or a defective consumer product, it's important to get professional advice as quickly as possible. In addition to seeing a doctor, you should also discuss your case with an injury attorney to find out if you could be eligible to file a lawsuit against the negligent party. If you've been in an accident, we can listen to the details of your case to see who may be liable for the costs of your injuries. Simply fill out the form on this page today to make an appointment for an evaluation.